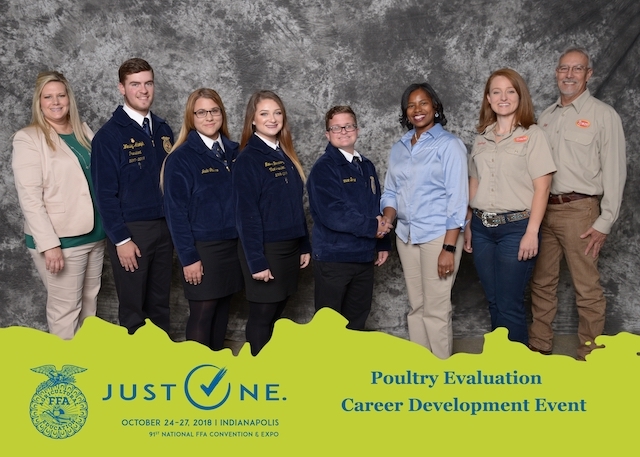 Four members of the Assumption High FFA poultry evaluation team represented Louisiana at the National FFA Poultry Career Development Event held in conjunction with the National FFA Convention in Indianapolis, IN October 23-27, 2018. The competition brought together 39 state winning teams from across the country to test their knowledge and skill about the poultry industry. Team members are required to compete in several phases of the event including, interior and exterior egg quality grading, carcass evaluation, processed poultry evaluation, live bird evaluation, carcass parts identification, a general knowledge exam based on the poultry industry, as well as a few other areas. The level of knowledge required to compete at the national level is extremely high. Given the geographic location of Assumption High School in Napoleonville, LA, the access to the poultry industry as a resource for training and experience was limited. The closest poultry farm to the school is over two hours away while the nearest poultry processing facility is in Natchitoches, almost a 5 hour drive. The team members worked diligently throughout the summer and fall in preparation for this event. Their investment of time and hard work has certainly paid dividends. In addition to achieving their goal of placing in the top 10 in the country, members were also rewarded with team and individual awards, scholarships, and an all expenses paid trip to the International Production and Processing Expo in Atlanta, GA courtesy of the U.S. Poultry Foundation.